You may wonder about the appearance of new weeds in your gardens and lawns this time of the year. These are winter annual weeds, which began germinating in the fall. They are viable for the good part of a year (hence, their designation as ‘annuals’). Their seeds began germinating in October, and they thrive from fall through early spring. They die off by summer. If you are on our year-long weed prevention plan, you know that we recommend applying weed preemergents several times during the year in order to address weeds that germinate during different seasons. The late summer, early fall application will prevent germination of weed seeds in the fall that produce the weeds that you see during the winter. We’ve had many warm days this winter, and these are opportune occasions to go out and pull up these winter weeds. Otherwise, if left to mature, they will produce flowers that will bloom in the spring and produce seed pods that will broadcast and drop seeds and increase your weed problem manifold. Another imperative reason to remove these weeds is that many can harbor undesirable insects such as aphids that will attack your desirable herbaceous plantings or shrubs once they begin to sprout in the spring. 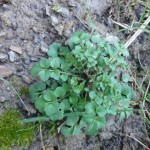 (1) Hairy Bittercress. The plant produces flowers in clusters at the end of stems, which will produce seeds that will spread many feet from the parent plant. (2) Purple Deadnettle. The bottom leaves are dark green, but the upper leaves appear purple or red, and whorls of purple flowers will develop in them. It will produce purple flowers in the upper leaves. 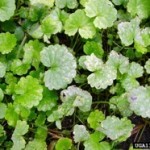 (3) Creeping Charlie is a spreading weed that appears in shady as well as sunny areas and can easily overtake lawn and garden areas. It is extremely invasive and should be removed when apparent. 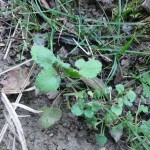 Since we seem to have a day or two of fairly warm weather each week, you’d be well served by using such days to go out and simply pull these winter annual weeds. Otherwise, if you wait until they flower and then explode in seed in the spring, your weed problem will increase dramatically. Removing the weeds now before they produce flowers (and in the future, applying weed preemergents seasonally — including in the fall) will reduce your weed maintenance needs in the future.